COLUMBIA, MO. – Camdenton resident Jessica Jensen is one of an estimated 20 percent of Missourians between ages 25 and 64 who have some higher education but no college degree. Jensen works full time at a preschool and is taking online classes through a Missouri community college. And now, because of a new online program in communication at the University of Missouri, she’s taking steps to become a Tiger. “When I heard from a friend who goes to Mizzou that more online classes were opening, I knew I wanted to check it out,” Jensen said. Communication is one of nine new online degree options opening in August. The new online bachelor’s options also include information technology, psychology, sociology and English. At the graduate level, Mizzou is opening online degrees in biological engineering, industrial engineering, care management and dispute resolution. These nine online programs will bring Mizzou’s online degree portfolio to 125 options — more than any other Missouri university. Providing access to a Mizzou degree is at the heart of our land-grant mission, MU Provost Latha Ramchand said. 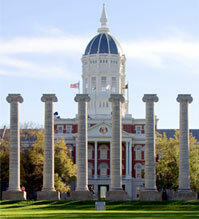 Many of Mizzou’s online students are in their late 20s and early 30s and are using MU degrees to get ahead in their jobs. With the addition of several bachelor’s degree options, people with or without previous college credit can earn credentials that will open career doors. “Mizzou brings together an incredibly comprehensive experience for students whether they learn with us in person or online,” said Elizabeth Loboa, vice chancellor for strategic partnerships and dean of the College of Engineering. Loboa is excited for students to experience the interactivity and connectedness these new online classes will provide. The new graduate-level online options also are designed to help students get ahead in their industries. For those who want to advance in the health care field, the Sinclair School of Nursing is offering a master’s in care management. The MU School of Law is opening the Midwest’s first online master’s program in dispute resolution, and the College of Engineering is offering programs in biological and industrial engineering. Jensen, who has a 3-year-old daughter, is grateful for online degree opportunities. She is no stranger to multitasking. “A typical day for me already means bringing my laptop to work and doing homework during breaks and after I’m done planning for the next day,” she said. Ramchand said Mizzou’s interactive online classes give students the education they need to advance and the flexibility they need to fit in college amidst work and community obligations.